Thank you for your letter of 14th November concerning Commander Brian Paddick and the rank of the chief officer in Lambeth OCU. We were, of course well aware of the MPA’s ACPO conduct subcommittee’s decision and are delighted that Commander Paddick has been completely exonerated. We have been told by your colleague Nicholas Long (MPA member for Lambeth and speaking at the November meeting of Lambeth PCCG) that the MPA exists to hold the Commissioner to account. Indeed such was also the thrust of your own presentation to the London Conference on 9 November. The handling of the Paddick affair is now primarily an issue of trust and confidence, not of operational policing, and thus falls squarely within your remit and democratic purpose. It is therefore regrettable that you chose not to respond directly to our letter but chose instead to relay the Commisioner’s “standard response”, albeit by implication indicating your own concurrence with it. Can the Met (and the MPA) be relied on to resist politically motivated attempts by unaccountable agencies to determine policing decisions, or are they minded to “roll over” if the attempt is relentless enough or coming from particular quarters? Can the Met (and the MPA) be relied on to defend their officers when they are subjected to malicious attacks, particularly those exploiting prejudice against an individual’s sexual orientation? Is the Met itself free, institutionally, from such prejudices? Is the senior management within the Met capable of seizing opportunities (such as that presented by the cross community support for Brian Paddick) whilst managing risk (in this case continued media interference), or is the organisation irredeemably risk averse? 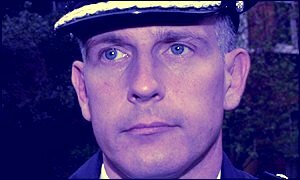 Does the Met have room for innovative and entrepreneurial officers, or shall Brian Paddick become an object lesson, encouraging officers to keep their thinking well “inside the box” and their heads below the parapet? Can we be confident that the Met and the MPA pay any heed to the expressed wishes of the Londoners they serve (and who fund the service) or is talk of consultation empty rhetoric? Can undertakings given by the Met be relied on? Does the Met commit substantial sums of public money, in this case £70k for the Accenture review, to rubber stamp decisions already taken? Are we really to believe that the unconvincing arguments (see below) give in the Commissioner’s “standard response” are the real reason for downgrading the Lambeth post? These are serious questions, and are very live in our Borough. They are of strategic significance and, we believe, fall within the ambit of your authority. Can you now address them, please? The remainder of this letter deals specifically with the key points of the Commissioner’s “standard response”. Given your accountability role, we hope you will be able to respond to the points we raise. Retaining an ACPO rank in Lambeth would result in up to four other boroughs demanding the same treatment. If this were Met by new appointments, rather than by redeployment out of Scotland Yard for example, this would incur an incremental cost of £960k pa. The same expenditure could fund an additional 24 constables. Accenture have been asked (by the Met and the GLA MPA) to assess the relative merits of these alternative strategies. We can well accept that other boroughs would seek similar treatment. A recurrent theme in messages to our website (www.lambeth4paddick.org) has been “If Paddick isn’t returned to Lambeth, can you send him over to [borough], we could do with some of the same”. Whilst it is not our place to argue the case for other boroughs, we do feel that their claims should be fairly assessed. The figure £960k pa is stated to be the incremental salary plus oncosts. This method of costing, though crude, is widely used to arrive at ball park figures in scoping exercises, throughout both the public and private sectors. Oncosts of 20-30% are normal. Taking a Commander’s salary to be of the order of £100k pa, the implication here is that an oncost of 92% has been used. This is truly staggering. Your authority states as one of its tasks “be accountable for the management of the police budget” and so you will doubtless have received full justification for this level of oncost. As tax payers, we would be very interested to hear it. It is not clear, however, that appointing ACPO rank officers to boroughs need incur an additional cost, whatever the true oncosts. The Accenture review is rightly responding to criticism of the baroque and exceptionally hierarchical management structure within the Met. However, across industry and commerce, attempts to de-layer organisations to produce flatter, more responsive structures are generally associated with pushing decision making closer to the “coal face” or “customer facing” functions. In this context, it is remarkable that the Accenture study is restricted to the boroughs and is not met wide, examining the option of deploying some of the many ACPO rank officers at Scotland Yard out to the boroughs. As a sponsor of that study, can you tell us please if this option has been considered and, if so, why it was not included in the brief for Accenture? The reclassification of Cannabis by the Home Secretary will, in most cases, result in warnings being issued to those found in possession of the drug (rather than their arrest), across London. The Met evaluation of the Lambeth Cannabis trial suggested that in Lambeth alone this would result in the saving of 2.4 constable equivalents, pa. Scaling up to London (on the basis of reported Possession offences, the bulk of which are for cannabis) this would suggest a Reclassification Dividend for London of some 40 constable equivalents. This in itself provides generous compensation for any displacement of constables by the appointment of ACPO rank officers to boroughs. This number of constables pales into insignificance when taken in the context of the scale of recruitment the Met is currently undergoing, rising from current levels of 27,000 to 35,000 over the next few years. This scale of recruitment will, in itself, heavily skew the age (and experience) profile of the force downwards, especially in the boroughs. This will be further exacerbated by the slew of officers coming up for retirement, a point forcibly made by the Metropolitan Police Federation. In such circumstances, we suggest that the argument for enhancing the resilience of command in the boroughs will grow stronger as time goes on. Doubtless, manpower planning weighs heavily on your concerns and you will have examined these factors exhaustively. Could you please share your conclusions with us? That, because of Project Walrus, Lambeth’s crime figures are now in line with other boroughs, and sustainedly so, obviating the justification for a Commander rank. o Brian Paddick’s success in harnessing support across the community. He made no reference to Project Walrus, the Local Authority’s current levels of investment or erstwhile deficiencies in the same. If this was indeed the real driver, why not? The Commissioner’s “standard response” presents data for selective periods and for only particular types of crime, in support of his argument. It is important to understand the broader context. The Commissioner uses Street Crime (by Met definitions Personal Robbery plus Snatches) as the key barometer. The figure below shows Lambeth’s level of reported Street Crimes as a share of the London total; in this way we can isolate Lambeth’s performance from London wide effects such as the redeployment of officers following 9/11 or the Safer Streets initiative. The figures are taken from the peak in Lambeth’s share, which was in July 2001. It is clear that Lambeth’s best improvement, measured against the rest of London, was between the first and second periods ie prior to the implementation of Project Walrus. More worryingly, whilst the reduction appeared to continue initially in the third period, following Commander Paddick’s departure and the introduction of 140 additional officers, this trend appears now to be in reverse. In fact, the figures for October 2002 (number of offences 493, share 10.1%) are now approaching those of January 2001 (number of offences 497, share 11%), the point at which the Met felt it necessary to introduce an ACPO rank officer to head up the Borough’s policing. On the basis of Street Crime alone, we are not convinced that the “sea change” the Commissioner points to is in fact being sustained. This must be an issue on which you have, in your accountability role, a view and we would be grateful if you could share it with ordinary people in the Borough. Of course, Street Crime is a major concern because of it’s psychological effect on citizen’s going about their business. But we should not lose sight of other, often more serious, crimes such as those involving guns, murders or domestic violence. Again, comparing Lambeth with the rest of London, we see little evidence of a “sea change”, comparing January 2001 with October 2002. That there was justification for the Commander rank in January 2000 because of insufficient investment by Lambeth Borough Council. This was evidenced by PA Consulting’s Review of the Resource Allocation Formula used within the Met. Lambeth had a far higher level of crime than could be explained by the correlation model underpinning the Allocation Formula. It is a commonplace management technique to use such models to identify “outliers” (cases which are exceptions to the statistical rule), as being cases specially meriting managerial action. Strictly, this means that the model is not a good one for those cases and that some other factor must be sought, relying on judgment rather than mathematics. The model itself in no way justifies such judgement, which is by definition outside the model. We are being told that the reason for Lambeth being an exception was the level of investment by the Borough Council in the Crime and Disorder Strategy. Such was not made clear at the time. Nor was the notion that an officer of ACPO rank was put into the borough to address this issue and then move on, not even to the individual concerned! Moreover, for people who have lived in the Borough for many years the real reason for Lambeth having higher crime figures, than might be expected from social indicators, is the long history of distrust between the police and the community and the impact that has on the police’s capacity to do their job. Doubtless the Commissioner has supplied you with some firmer evidence to back this claim. Do you have to hand the expenditures by Lambeth Borough Council on the Crime and Disorder Strategy for the periods before, during and after Brian Paddick’s tenure in the Borough (F/Y 2000/2001; 2001/2002 and budgeted 2002/3)? We would be grateful to have sight of such. Have you, or the Met, asked that such expenditures, for all boroughs, be incorporated into the model as variables? In this way the hypothesis may be quantitatively tested. Perhaps this would be a useful task for Accenture? Thank you again Lord Harris for responding to the letter from our public meeting. We hope you will now agree that the key issues are now ones of trust and confidence, and ones which you need to address. We hope you will also understand why the Commissioner’s “standard response” does little to restore such confidence, raising more questions than it answers. We look forward to your response. We consider this correspondence to be in the public interest and shall therefore publish it on our website as well as making copies available to interested parties.